Eating healthy, delicious, yet affordable meals every day can often be a challenge. With winter around the corner, a slow cooker is an ideal appliance to have in your kitchen to help you prepare nutritious and delicious meals. What’s great about cooking with it is that preparation is typically a one-step process, it saves time, it is easy to clean and it allows you to cook in bulk, saving you frequent trips to the grocery store. Make use of your slow cooker this winter and try out a variety of balanced, flavourful dishes. Use your slow cooker at every meal of the day. Slow cookers aren’t just for dinners – try mixing it up by prepping breakfast the night before in the slow cooker. If family are staying for a weekend, whip up a Breakfast Casserole or Cranberry-Pecan Oatmeal Porridge so you can all wake up to something hot and ready to be enjoyed. Make some simple sweet treats. Baking a cake has never been easier! Try making Carrot Cake or Berry Cobbler to impress your loved ones with a tasty dessert this winter. This could be fun to make with your grandkids, too! Explore flavours of the world. Travel to warmer parts of the world through the traditional flavours of countries with aromatic spices and sauces. Take a little bit of Morocco home with Moroccan Braised Short Ribs, or welcome some Caribbean heat with Jamaican Jerk Chicken. Or, bring South East Asia to the table and make Thai Chicken Curry or Vietnamese Pho Soup. All of these rich global flavours will be sure to warm you up on a winter day. Save money on protein. Because a slow cooker can cook meals at a low temperature for a long period of time, meat prepared with it always turns out tender and juicy. Using your slow cooker will allow you to buy inexpensive cuts of meat like beef shoulder or round; also, you don’t have to splurge for boneless chicken when using your slow cooker, because the meat becomes so tender it falls right off the bone! Try BBQ Chicken or an easy Beef Pot Roast to enjoy an amazing meal and a smaller grocery bill. Use low sodium stock or broth. Make sure you cook with low sodium broth in your slow cooker; it will help you manage your sodium intake. Use the timer function. If your slow cooker features a self-timer, you can use it to control when the pot turns off, so all your meals will be cooked to perfection and you won’t have to worry about turning it off before you leave the house. Use baking soda to clean your slow cooker. Baking soda is naturally abrasive and is a great alternative to toxic, corrosive cleaning products – sprinkling a bit in the pot will help you scrub away cooked-on food. The coming winter can be filled with delicious, hearty meals when you use these simple tips and recipes to take advantage of your slow cooker. 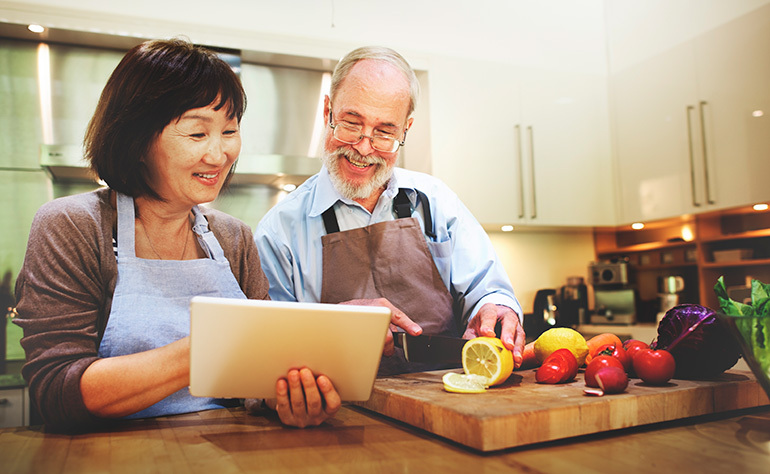 If you need a helping hand in the kitchen, Bayshore caregivers are available to help with preparing meals, grocery shopping, and light housekeeping. We offer a range of home care services in the comfort of your home. A little extra help can make life at home a lot more comfortable.